Who better to be charged with the resurrection release for a highly respected once-vinyl, now relaunched as digital only imprint than one of the godfathers of acid music? OK, so Deeplay is synonymous with more than 303s, but nevertheless our point is that to bring something great back you need someone great involved, and ideally on the kind of form we find the Chicago-born pioneer here. 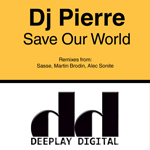 Despite its seemingly stepping opening rhythm, it takes a matter of seconds (give or take) for the Original Save Our World to erupt into a raw, rolling high-energy party techno track. And, once the weighty kicks and throbbing low end drop- complete with all manner of synthesized buzzes and warbles, and a manic looped vocal sample- there’s very little time to stop for a breather. In short, marching orders are issued. Those looking for a more poised, deep-edged affair are likely to prefer Alex Sonite’s excellent housier take on things. Much more understated, replacing those acidic elements with dubbed melody hook but somehow managing to maintain the ‘big’ feel of its source material, it straddles a middle-ground that’s been difficult to find since the decline of techy prog house. A contrast to Sasse’s powerful, hypnotic chugging variation, or the surprisingly euphoric, potentially EP-winning cosmic elec-disco interpretation pieced together by Martin Brodin, seemingly with players like Andrew Weatherall and Ivan Smagghe in mind. Four solid reasons to buy then.